If you’ve had enough of cereals and bacon, eggs, and sausage for breakfast, and pancakes just don’t quite cut it anymore, think about the possibility of waffles. No, you don’t have to go out for breakfast to get them. Make them at home with your own waffle maker. And whether you’re a beginner in the kitchen or a veteran of years, you might like to try this offering from Cuisinart. If you like a good waffle, you will appreciate what Cuisinart has done in the design of this little appliance. The Cuisinart Belgian waffle maker is one of the best Belgian waffle makers you will find in the market. A compact, attractive, durable, and restaurant grade waffle maker that’s easy to use, even the connoisseur will like this machine. Easy and simple to use, this product is for anyone who wants fresh, hot waffles for breakfast from their own kitchen and who needs to make them quickly. However, I warn you, this waffle maker is far more expensive than other comparable waffles. On the upside, if you have a large, hungry family clamoring for their breakfast waffles, this one will make two at a time. Once made, you can easily tear them into halves or quarters to feed your hungry crew, then go back to the machine to make more. Open the box and you’ll find the waffle maker, a user manual in both English and Spanish, and a measuring cup for the batter. As always, read the user manual to learn about your new appliance and its capabilities, as well as find some recipes for making waffles. You may find some things to make you never thought of. Use the measuring cup to determine how much batter to place in the waffle maker. However, you may want to use a spoon or two more than the cup will hold as the videos show that using the batter cup alone produces waffles that are a little on the skimpy side. The biggest feature of this waffle maker is that it will make two waffles at a time. They are deep, at about 1”, which allows for adding lots of good toppings that will sink down into the waffle to enhance the flavor. The browning control has six settings that ensure that each waffle is made to order. And the waffles bake quickly, in about 4 minutes. When you take them off the grid, you can easily tear them or cut them into halves or quarter to satisfy breakfast appetites. The nonstick coating allows you to remove baked waffles easily and without worries about cleanup. Unlike most, this waffle maker has 1400 watts of power, so you know it can get the job done. Though made for home use, this waffle maker is definitely of professional quality, and plugs into any 120V outlet. The waffle maker sits in a cradle that enables the appliance to rotate 180° and it is this feature that allows you to make two waffles at a time. Any professional chef would appreciate the quality of this appliance, but so can the beginner. 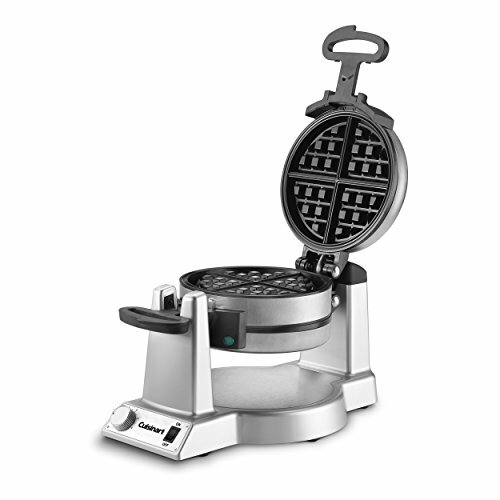 As simple to use as any lower end waffle maker, it boasts Cuisinart quality and durability. In addition, it’s very simple to use and care for. To use, simply mix up your waffle batter. Plug in the waffle maker. When the indicator light lets you know it’s ready to bake, add the batter to the cook plate. Flip it over and add the batter to the other plate. Flip it again to evenly distribute the batter and wait for the indicator light and the beep to tell you the waffle is ready. When it’s ready, the waffle maker will beep three times and you can remove the waffle to serve. Tear it into halves or quarters if you wish or serve as a single waffle. For a complete demonstration on how to use this waffle maker including how to prepare the batter, have a look at this video. While this waffle maker is of excellent quality, is easy to use, durable, and produces delicious waffles, it is quite expensive. Yes, it produces two waffles at a time, but if you have no need for that, a less expensive appliance with similar features might work well for you. One possibility is the Oster Belgian Waffle Maker. Far less expensive, this one is every bit as easy to use and to clean and makes one waffle at a time. However, if you particularly like the flip feature, the Presto Ceramic FlipSide Belgian Waffle Maker will also work. They both work well and produce a delicious waffle in about 4 minutes. Just reading about this waffle maker makes me want to run out and buy one until I get to the price, especially since I have no particular need to make two waffles at a time. But, I cannot deny it is a quality product and those who bought it like it very much. You can always count on Cuisinart to produce a quality product and this is no different. As a consumer, however, you must decide if you want or need certain features as well as how much you want to spend. Then make an informed decision.